G4S to run child protection services? Get ready to fight the frackers! 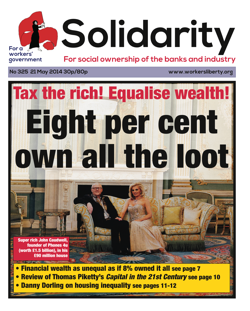 Workers at the Ritzy cinema in south London will strike again on Wednesday 21 May from 5 p.m. The workers, who are members of BECTU, have undertaken a sustained campaign of strikes, protests, rallies, and other actions, to win the London Living Wage. A similar campaign of BECTU members at the Curzon cinema in Soho was recently given an official award by the union at its 2014 AGM. The GMB, Britain’s third largest union, will join Unison and Unite in balloting its members in local government for strikes to win a new pay deal. Members in all three unions overwhelmingly rejected the offer of a 1% increase from local government employers, by margins of 83%, 70%, and 90% in GMB, Unison, and Unite respectively. On 17 May, around 300 activists marched from Clapham to Brixton in defence of the striking workers at Lambeth College. The demo was called by UCU, after a judge took out an injunction on their members on April 30 preventing them from going on all out strike, following an attack on their terms and conditions. UCU members had voted 95% to strike. On May 7, Unison members also voted 83% to strike over the same issues. We are not in Sligo although it might seem so from time to time. We are in “the world” and when “the world” is the subject we have to expect a certain lack of realism and the onset of allegory. Who is going to kill the Roman Catholic priest (Brendan Gleeson) is the whodunit aspect, but the sins of “the world” and their victory are the real issue; and it fills the space between, on Sunday, a promise to kill the parish priest and, a week later, the murder itself. And what a week! So says Thomas Piketty in his book Capital in the 21st Century. It is a best-seller in France, where it was originally published, and now also in Britain and the USA, despite costing £30 and stretching to 640 pages. Other reports, however, indicate that the worker patrols were instigated by oligarch Rina Akhmetov, owner of the local steelworks, and are led by the works boss. Ukip may come top of the Europolls in Britain on 22 May. The Front National, which has a clear-cut fascist lineage, leads in pre-poll surveys in France. Right-wing populist “anti-European” parties will do well in other countries. In Germany, the new, right-wing, and anti-euro AfD is at 6% or 7% scarcely a year after being launched. Ironically, Greece, the country which has suffered most with cuts plans from the European Union and European Central Bank, is an exception. Two sets of data released in the last week show the extent to which the distribution of wealth in Britain is highly unequal, and increasingly so. The first data come from the government’s Office of National Statistics wealth survey for 2010 to 2012. This shows that the richest 10% own 44% of all household health, and the bottom half own only 9%. The top five billionaires own the same wealth as the poorest 20% of the population. Thousands of people have fled from the Iraqi city of Fallujah as the government army attempts to recapture it from Islamist rebel control.